Learn and practice the seven Leave No Trace principles. Carry out what you have carried in. Do not leave gear, food, or other items at lean-tos and campsites. Do not litter. Take the free online Leave No Trace course here. BE PREPARED! Start slow, gain experience. Always carry proper safety equipment – including plenty of food, water, flashlights, space blanket, emergency whistle, first aid kit, fire making tools, extra clothing layers and socks, and a map and compass – inform someone of your itinerary, and be prepared to spend an unplanned night in the woods in cold temperatures. Just before entering the backcountry or launching a boat check the National Weather Service watches, warnings, and advisories here. 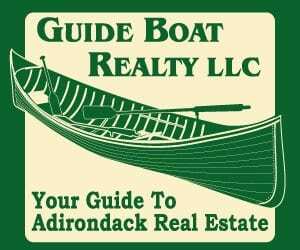 Follow Adirondack weather forecasts at Burlington and Albany and consult the High Elevation, Recreation, or Lake Champlain forecasts. LAKE EFFECT SNOW / WINTER CONDITIONS: Prepare for winter conditions – cold temperatures, ice, and deep snow in the backcountry. Ice crampons and traction devices should be carried for use on icy portions of the trails including summits and other exposed areas. Lake Effect snow is falling in St. Lawrence, Lewis, Herkimer, and Hamilton Counties. By Saturday there could be a foot in new snow Northern Herkimer County, and 4-8 inches throughout the Western Adirondacks. Before entering the back-country check the latest National Weather Service local weather watches, warnings and advisories here and Mountain Forecasts here. SUMMIT CONDITIONS: Summits temperatures will be only in the single digits to the teens, and there could see some occasional light snow through the weekend, especially west. Summit wind speeds mostly 30 to 35 miles per hour will keep windchills in the -20s Friday, and the teens and single digits below zero through the weekend. Before entering the back-country check the latest National Weather Service local weather watches, warnings and advisories here and Mountain Forecasts here. SNOWSHOES OR SKIS REQUIRED: Snowshoes or skis are required in the High Peaks Wilderness and recommended wherever snow depths exceed 8 inches. Snowshoes or skis ease travel on snow and prevent “post holing,” which can ruin trails and cause sudden falls resulting in injuries. DOWNHILL FACILITIES: It’s been a notably early season for skiing. Whiteface and Gore mountains should have about 35-40% about evenly split terrain for all levels, though no glades or slides. Titus Mountain closed this week, but may be open this weekend so call ahead at (518)483-3740. Oak Mountain will have skiing Saturday on Sacandaga and the bunny hill, 9 am to 4 pm. Beartown in Plattsburgh opens Saturday, believed to be the earliest opening date in many years. McCauley will be open with a couple lifts, and some limited terrain this weekend. Big Tupper and Hickory near Warrensburg remain closed. CROSS-COUNTRY SKI REPORT: All nordic facilities around the region will be open this weekend with generally good conditions, though a little fast. The best bet this weekend would be at Garnet Hill, which about 20 km groomed and tracked, and has been getting fresh snow the past several days. The Fern park Trails in Inlet also have excellent conditions. BACK-COUNTRY SKI REPORT: The Jackrabbit Trail and early season backcountry routes remain skiable, though early season warnings apply. The best bet is smoother terrain such as Connery Pond, Fish Pond, Hays Brook, Gulf Brook and especially Newcomb Lake Road. Note that Lake Lila will be plowed and not available for skiing this weekend. Whiteface Highway is still being plowed. The Marcy Dam Truck trail is skiable, the hiking trail from Adirondac Loj is not recommended. There is now enough snow to ski from Marcy Dam through the pass to Lake Colden, though the lakes may not be yet crossable after warm weather this week. 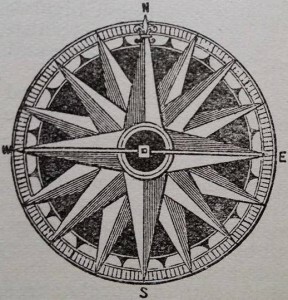 Marcy and Wright Peak are yet not recommended due to thin approaches. 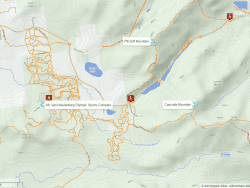 An update with more detailed conditions in the Tri-Lakes and High Peaks area can be found here, courtesy the Adirondack Ski Touring Council / Barkeater Trails Alliance. 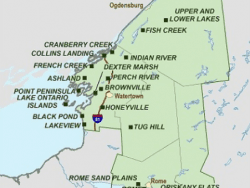 SNOWMOBILE REPORT: Lakes are unsafe for snowmobiles! Excepting Warren, Eastern Hamilton and Eastern Essex Counties, most snowmobile trails are open and in FAIR to GOOD early season conditions. In Herkimer and Western Hamilton counties, conditions will be GOOD to VERY GOOD this weekend with plenty of new snow in the forecast by Saturday. The C7 Snowmobile Trail (the Remsen-Lake Placid Travel Corridor) between Beaver River and County Route 10/Sabbattis Road in the Towns of Webb and Long Lake, Herkimer and Hamilton Counties is closed to snowmobile traffic while emergency work takes place to repair several sections of trail which have been washed out. THIN ICE: Ice has begun forming most lakes and ponds and backwaters. No ice is safe at this time. Warm temperatures are expected. Although ice may have snow on the surface, it is not thick enough to hold the weight of a person. Ice will remain unsafe until temperatures fall below freezing for a significant continuous period. RIVERS AND STREAMS HIGHER, RISING: Waters around the Adirondacks are above normal for this time of year. STREAM GAGES: The following streamgage readings were observed on Thursday afternoon. Follow the latest river forecasts here and USGS streamgages here. SUN AND MOON SATURDAY: Sunrise Saturday in Lake Placid will be at 7:19 am and sunset at 4:16 pm, providing 8 hours 58 minutes of sunlight. The Moon will rise at 8:18 am Saturday morning, and set at 5:38 pm, Saturday night. It will be 2% illuminated. DO NOT RELY ON TECHNOLOGY: Do not depend on electronic technology in the backcountry. Cell phone coverage is spotty at best and often non-existent. GPS signal can be poor under heavy tree cover. Batteries expire quickly in cold temperatures. Plan and prepare carefully before entering the backcountry and always carry a map and compass – and know how to use them. 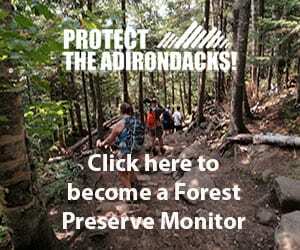 FIRE DANGER: The fire danger for the Adirondacks is LOW – use caution with open fires. Each year DEC responds to numerous wildfires, many started by unattended campfires. Fires are prohibited in the Eastern High Peaks. It is illegal to leave an even smoldering fire unattended. Consult the current New York State Fire Danger here. BE ALERT FOR MOOSE AND DEER: The peak period for vehicle collisions with whitetail deer and moose is October through December, with the highest incidences occurring in November. This is the peak of the annual breeding cycles when deer and moose are more active and less cautious in their movements. Motorists should be alert especially at dawn and dusk, which are times of poor visibility when these animals are most active. Much larger than deer, moose-car collisions can be very dangerous. The best way to avoid a collision with deer or moose is to reduce speed, be alert for their presence on or near the highway. When you see one, you are likely to see others nearby. Slow down immediately if you see deer or moose on the side of the road. INCREASED BEAR ENCOUNTERS: DEC received a higher number of bear incident reports this year in the Adirondacks. Bear encounters get more numerous at this time of year as bears have learned how to get food from humans and are bulking-up for winter (this summer’s drought in the Adirondacks is also a factor). Cook, wash, eat, and clean-up before dark. Protect garbage and other food sources in camp and at home from bears. All food, toiletries and garbage should be stored in bear-resistant canisters to avoid negative encounters with bears throughout the Adirondacks. The use of bear-resistant canisters is required for overnight users in the High Peaks Wilderness between April 1 and November 30 and recommended everywhere. AVOID MINES AND CAVES WHERE BATS ARE PRESENT: DEC has urged outdoor adventurers to suspend exploration of cave and mine sites that may serve as seasonal homes for hibernating bats. Human disturbances are especially harmful to the State’s bat population since the arrival of the disease known as white-nose syndrome, which has killed more than 90 percent of bats at hibernation sites in New York. All posted notices restricting the use of caves and mines should be followed. If you encounter hibernating bats while underground, DEC encourages you to leave the area as quickly and quietly as possible. Anyone entering a northern long-eared bat hibernation site from October 1 through April 30, the typical period of hibernation for bats, may be subject to prosecution. Learn more here. KEEP PETS LEASHED: Keep your pet under control. Restrain your pet on a leash when others approach. 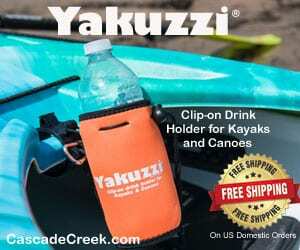 Collect and bury droppings away from water, trails and camp sites. Keep your pet away from drinking water sources. Dogs must be leashed in the Eastern Zone of the High Peaks when on trails, at primitive tent sites, at lean-to sites, everywhere above 4,000 feet, or at other areas where the public congregates. 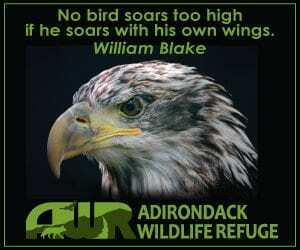 Dogs should be kept leashed everywhere in the Adirondack Park for the safety of your dog, the protection of wildlife and rare plants, and out of courtesy to fellow recreationists. GROUP SIZE RESTRICTIONS: Large groups have significantly more impact on the trails, natural resources and other users. DEC regulation restricts group size in the High Peaks Wilderness (which now includes the former Dix Mountain Wilderness) to no more than 15 hikers (day users) or 8 campers (overnight users) and encourages this practice to be followed in other areas. 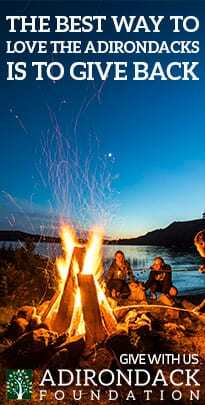 Outside the High Peaks Wilderness, DEC regulation requires a temporary permit be issued to authorize organized events of more than twenty people; camping at the same location for more than three nights; or camping in groups of more than 10 people. 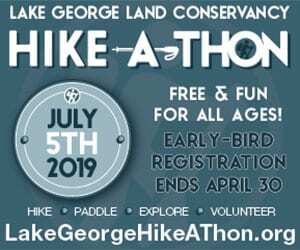 VOLUNTEER FOR TRAIL WORK: No matter what your sport, if you’re a trail user consider contributing your efforts to one of the many organizations dedicated to maintaining the region’s network of thousands of miles of trails. * indicates new or recent items. These are recent changes, older changes for this area can be found here. * Mt. Van Hoevenberg: The Mt. Van Hoevenberg Nordic ski center, in Lake Placid, is scheduled to open for the 2018-19 season, Saturday, November 17, weather and conditions permitting. Season passes for the 2018-’19 season are still available. Through November 26, adult passes are $200, senior passes are $165 and the teen passes are $140. The junior all-season pass is $70. Children six and under ski free. Route 73 Parking: Parking areas along Route 73 are now striped. Park in the designated parking spots between the striped lines. Do not park in hash marked areas or where No Parking signs are posted. Try some of these less crowded hikes. Route 73 – Roaring Brook Falls Parking: Parking is prohibited on the shoulders of both lanes of State Route 73 near the Roaring Brook Falls Trailhead. 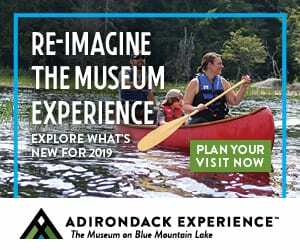 Parking is prohibited on the shoulder of the northbound lane from the entrance to the Roaring Brook Trailhead Parking area north to the bridge over Putnam Brook and on the shoulder of the southbound lane between the guiderails south of Putnam Brook Bridge. The New York State Department of Transportation is installing “No Parking” signs along these sections of the road. Read more about the closures here. Garden-Porter Mtn. Trail – Cascade Mtn. : The Porter and Little Porter Trail from the Garden in Keene are closed this 2018 hiking season due to the decision of a private landowner. A reroute is being planned, but will not be completed this hiking season. As this will limit access to Cascade via Porter – further crowding the Route 73 Cascade trailhead – approach Porter Mountain via the trail from Marcy Field until the reroute is complete. Cascade Mountain Trail Changes Coming: Recently approved amendments to the High Peaks Wilderness Area Unit Management Plan include changing access to Cascade Mountain. A new trailhead will be located at the Olympic Sports Complex at Mount Van Hoevenberg. This will increase the length of a round-trip by four miles to 8.8 miles total. The estimated completion date for this project is Columbus Day, October 14, 2019. According to the Adirondack Mountain Club’s High Peaks Trails, the current trail was constructed in 1974 to replace an older steeper badly eroded trail. Dix Mountain Wilderness: Group size regulations are now in effect on the lands in the former Dix Mountain Wilderness. Groups should consist of no more than 15 hikers and no more than eight campers. The lands of the Dix Mountain Wilderness are now part of the High Peaks Wilderness. DEC will be changing signs, web pages, and regulations to eliminate the Dix Mountain Wilderness and transition to the High Peaks Wilderness. Owls Head: Owls Head in Keene is open to hikers mid-week only. The public is prohibited from parking on the private road leading to the trailhead between 4 pm Friday and 7 am Monday. The trail to the summit of Owls Head is not an official DEC trail nor is there an easement for public use of the trail. Public use of the trail is at the landowner’s discretion. * Bike Trails: Trail stewards responsible for bike and fat bike trails in the Wilmington-Lake Placid-Saranac Lake ask riders to abide by trail closures posted on TrailHUB. Ouluska Brook Bridge: The bridge over Ouluska Brook on the Northville-Placid Trail has collapsed into the brook. Crossing the brook is possible only during low water conditions. ** C7 Snowmobile Trail: The C7 Snowmobile Trail (the Remsen-Lake Placid Travel Corridor) between Beaver River and County Route 10/Sabbattis Road in the Towns of Webb and Long Lake, Herkimer and Hamilton Counties is closed to snowmobile traffic while emergency work takes place to repair several sections of trail which have been washed out. Pigeon Lake Wilderness: There is an area with significant blowdown on the Norridgewock Trail about 1.5 miles south of Beaver River Station. A rough and temporary reroute has been flagged with pink flagging. All users should exercise caution when traveling through this area (7/5). * Saranac Lakes Wild Forest: The gate on the Connery Pond Road is closed. Use the nearby trailhead parking area along State Route 86 (12/6). * Dewey Mountain (12/4): Despite recent warm weather the trails at Dewey held up well and are in good conditions. Lower mountain groomed trails (Keough’s K, Cookie Monster, Peanuts) are open and currently best for skiing. Upper mountain groomed trails (Iron Bill, Timinator, Thanks Coaches) will remain closed until conditions improve. 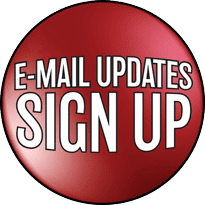 The next open house and registration for Dewey Mountain Youth Ski League, Lil’ Shufflers, and Outdoors and Active for Adults will be on Thursday, December 13th, from 3:30-5:30pm. Season passes are now available. Hours of operations through December are 10 am-4 pm. * Webb-Inlet Snowmobile Trails Systems: The towns of Webb—Inlet Snowmobile Trail System has GOOD to FAIR conditions overall, with 2” of new snow on up to 6” of base. Trail #8 is best. Trails #5 and #3 are GOOD, with wet spots. Trail #4 is GOOD to FAIR. Trail #7 has water holes. Upper Trail #2 and Doe Pond are being resurfaced with snow. Trail #9 from Rondaxe to Doe Pond is plowed for vehicles. Trail #6 below Thendara is MARGINAL due to water and lack of snow. Please use caution, early Season Conditions prevail. Black River Wild Forest: Stone Dam Trail north of Stone Dam Lake to its intersection with the Chub Pond Trail is overgrown and can be hard to find and follow. Independence River Wild Forest: The Erie Canal Trail Bridge over Otter Creek has been damaged and is closed indefinitely. Ha-De-Ron-Dah Wilderness: Moose River Mountain Trail has heavy blow down and is difficult to follow at times. East Pond-Lost Creek Trail between East Pond and the Big Otter Lake East Trail is rough, grown in and may contain blowdown. The trail is difficult to follow at times. * Long Lake – Raquette Lake Snowmobile Trails: The Long Lake – Raquette Lake snowmobile trails are not yet open. * Paul Smith’s VIC Conditions: This weeks cold temperatures have firmed up bases across Paul Smith’s VIC’s trail system. VIC staff has been out working to freeze up some tricky wet spots and flicking branches. They received 2″ of fresh cold snow yesterday that skied wonderfully over the base. 2-5″ on the way by Friday morning will provide optimal winter skiing and snowshoeing this weekend. They will host the first snowshoe race in the state, the 25th anniversary Jingle Bell 5K Snowshoe Race on Saturday (It’s a small event usually about 30-40 racers). For more information click here. Siamese Ponds Wilderness: Two foot bridges have collapsed. The 55-foot bridge over the East Branch Sacandaga River on the Botheration Pond Loop Trail has collapsed and cannot be crossed. Do not attempt to scramble over it. During low water, rock hopping is possible. A 30-foot bridge on the Puffer Pond Trail over a tributary to the Thirteenth Lake south of the lake collapsed earlier this year and cannot be crossed. Jessup River Wild Forest: The Oxbow Trail has reopened. * Schroon Lake / North Hudson Snowmobile Trails: Schroon Lake / North Hudson snowmobile trails are not yet open for the season (12/6). * Warren County Snowmobile Trails: Snowmobile trails in Warren County are not yet open for the season (12/6). * Lapland Lake Ski Conditions: At 8 am Thursday it was snowing with a coating of new powder, and forecasts says they are likely to get a bit more between now and Friday morning. Thursday they had approximately 8K of XC trail open for skiing – Lake Trail, Vasa, connector trails, practice field, and a short modified loop on the West side. Surface is a mix of frozen and loose granular with a bit of fresh powder. It skis fast and smooth. Lake Trail has a nice even surface suitable for both skate and classic. Conditions may slow during the day depending on amount and timing of new snow. Tracksetting is very limited, we will likely have more tracked for Friday and the weekend. Snowshoe trails are open, junior tubing hills are closed. Be sure to properly prepare and plan before entering the backcountry. 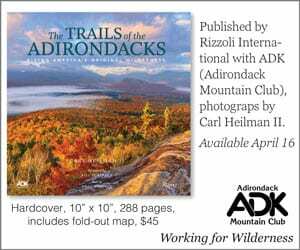 Visit DEC’s Hiking Safety webpage and Adirondack Trail Information webpage for more information about where you intend to travel. 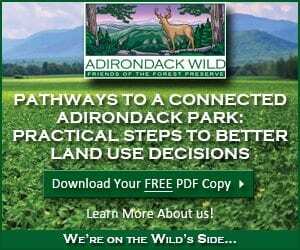 Check the Adirondack Almanack Outdoor Conditions Reports each Thursday afternoon. 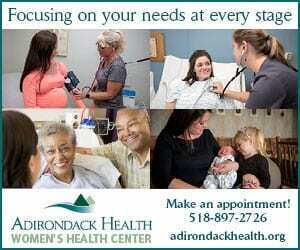 A map of the Adirondack Park can be found here; active alerts are updated by noon Friday here. 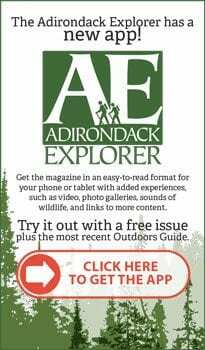 This weekly report of outdoor recreation conditions in the Adirondacks is compiled by Adirondack Almanack founder and editor John Warren for publication each Thursday afternoon. John’s condensed version for radio can be heard Friday mornings on WSLP Lake Placid, and the stations of North Country Public Radio. 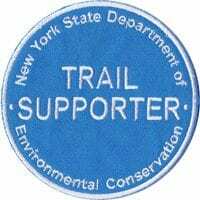 The NYS Trails Supporter Patch is available for $5 at all outlets where sporting licenses are sold, on-line and via telephone at 1 (866) 933-2257. 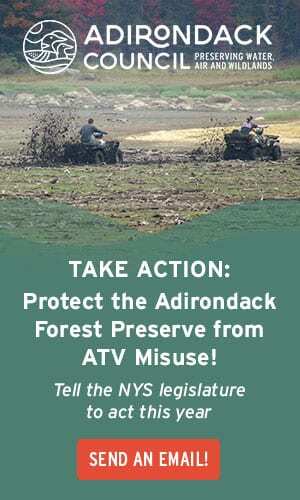 Patch proceeds help maintain and enhance non-motorized trails throughout New York State.